Once a week, usually in the morning, the fruit and vegetable man drove his Jewish truck down our street in Cape Town, stopping outside our home and blowing the horn. Until I walked out to look at his truck, I didn’t know motor vehicles could be Jewish. But there it was, on the nose, a star of David, with the initials “DB” in the center. Dodge Brothers. Even then it was an old truck, Dodge having been acquired by Chrysler Corporation in 1928. Maybe that Jewish truck was why my parents felt good about purchasing produce from the old man, who was certainly younger than I am now. Growing up in a major port city, I knew that ships could be Christian, having once read about the violent process of christening, smashing a bottle of champagne on the hull, and hoping that my Christian friends survived their baptism intact and sober. We lived in a small flat, in a block of four very modest homes. The other residents were also Jewish European refugees. Mother would take her purse, and go out to the truck and buy fruits and vegetables on a very limited budget. In summer, on rare occasions, she would carry in the ultimate treat: a tiny wicker basket, lined with leaves, containing a dozen or do small strawberries. After dinner, my parents and I shared the delight, sometimes annoyed at the rotten ones. Dad and Mom were Litvaks, who grew up in a northern climate that favored berry fruits, so our fridge usually had a bottle of strawberry jam, to be applied in very thin layers to rye bread. I can remember at least two occasions when, just returned from junior school, the only snack available was a cup of tea and a piece of toast with breadcrumbs scattered on top. Mom and I laughed about our inventiveness. As the years went by, Dad made more money and we moved to a more comfortable flat on a hill. There were a dozen pine trees on the property, and that’s when a friend introduced me to pine nuts. We’d search for fallen cones, and remove the nuts. By placing them on top of the brick wall that surrounded the property, we’d use a fist-sized rock to smash the shell, rescuing tiny, mashed portions of the nut. It was a lot of effort for very limited results, and may have sparked my later interest in Adam Smith. As we became better off, the range of fruits, nuts, and other comestibles became more ample, and included small amounts of European chocolate, but those early days and the Jewish truck have stayed with me. Now, so many years later, here in California, the legacy of early privation hasn’t entirely escaped. My wife and I greatly enjoy having friends over to dine. Just recently, I stopped at a local farmer’s market to buy ingredients for the fruit salad we’d serve for dessert. 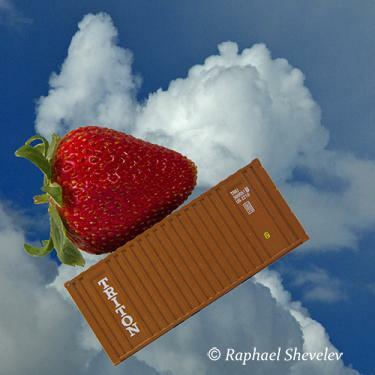 Among the other items, I came back with three pounds of luscious California strawberries, each one so ample that it seemed to require an entire shipping container for itself. I also bought a pound of shelled pine nuts to scatter in the dinner salad. Good food, great friends. I think your Jewish Truck piece is a gem. 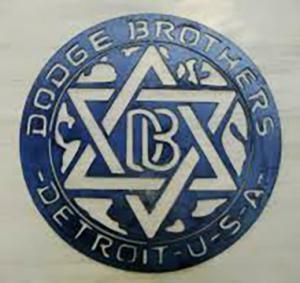 I was not aware of the Magen David usage by Dodge, but looking it up, saw that one suggestion was that the Dodge Brothers were contemptuous of Henry Ford, and that the symbol was supposed to needle that arch anti-Semite. What lovely work, Raphael. You are such a fine writer. In many respects, I see close similarities between your prosody and your photography. Luminous intelligence, rooted in extraordinary awareness of details that anchor complex and crucial constructs. Social matrixes. The impress of civilizations. Cooperations and conflicts among individuals, classes, communities. Constant, endemic genius for sheer beauty. Thank you Raphael for sharing your memories... I too remember a fruit and vegetable truck coming to our street in the Gardens - Hatfield Street - and my mom buying produce from there in fact I can still see it in my mind's eye and where it was parked. Its amazing how one image from a very long time ago can spark many other related images and connect with something similar that is happening in our lives in the present time. Enjoy your strawberries and pine nuts - an added joy could be eaten with ice cream which may also spark some more happy memories!